Marcio McFly plays a central role @51beats since the beginning, being an eclectic artist with interests ranging from analogue synthesizers to country music. Following the first machine-oriented experience with Spectacular Synthesizer, in 2009 Marcio founded “I CANI”, later on @icanigiganti, the live-analog synthesizer project that rocked the dancefloors until 2013 with a real live-techno experience. From 2009, Marcio McFly's “solo project” crosses different genres, as clearly defined since his debut-album “Farsi le Foto” that has been nominated in the “Discovery” category at the QWARTZ New Electronic Music Awards in 2010. 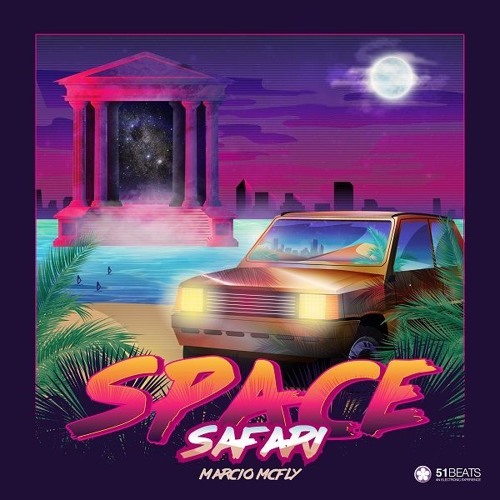 Being currently a member of the well-acclaimed @acid-castello madness-trio, @marcio-mcfly presents his latest solo-opera SPACE SAFARI, a superb genre-borders-crossing album where powerful italo hip-hop intersect electro and techno for the most exigent audience. Modular synthesizers and drum-machines meet hip-hop-beats (feat. @devia-clan) and vinyl-old-sKool scratches (feat. DJ Alan). Credits - in "Divorzio all'Italiana": @devia-clan and DJ Alan - in "Predicatori": Ingo from @devia-clan and DJ Alan - in "idris": DJ Alan and @devia-clan - in "Under Bass": Ingo and Isaac from @devia-clan - in "TR.B.ALL": Davide Contento - in "Armadillo": Isaac from @devia-clan and DJ Alan - in "Con Gas": Davide Contento - in "Arrivederci e Grazie": I Piedi - Mentre Dormi RMX by @double_prec Graphic Art by Jacopo Sacchi "Bhonz"